Each of our wellness therapiststs have a wide variety of techniques including deep tissue massage, relaxation massage, theraupetic massage and sports/injury massage to customize your healing experience. Naturopathic medicine is a unique primary health care system that blends modern scientific knowledge with traditional and natural forms of medicine. 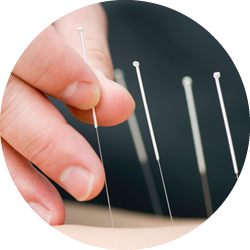 Acupuncture is the stimulation of precisely defined, specific acupoints along the skin of the body involving various methods such as the application of heat, pressure, or laser or penetration of thin needles. If you have extended health benefits through any of the major insurance providers, we have you covered. Just bring in your and/or your spouses insurance card(s) and we will process your claim while you are in your treatment. All of our health practitioners are fully licensed to meet all insurance requirements (ie. all massage therapists have 2200-hour certification, etc.) so there is no chance of a mix-up. If you have any questions feel free to ask us.